is elated to Celebrate the Life of this powerful example of empathy, faith, kindness, intelligence, perserverence and strength. Rising above extraordinary circumstance and false persecutions, this awakened male energy thrives teaching our world what true forgiveness and integrity and love really is. Always maintaining his dignity and self respect, entering into the land of politics in South Africa, this man never wavered in his devotion to democracy, equality and learning. Despite terrible provocation, he never answered racism with racism. His life has been an inspiration to all who are oppressed and deprived, to all who are opposed to oppression and deprivation. His father died when he was a child and the young Rolihlahla became a ward of Jongintaba at the Great Place in Mqhekezweni. Hearing the elder’s stories of his ancestor’s valour during the wars of resistance, he dreamed also of making his own contribution to the freedom struggle of his people. Nelson Mandela began his studies for a Bachelor of Arts Degree at the University College of Fort Hare but did not complete the degree there as he was expelled for joining in a student protest. He completed his BA through the University of South Africa and went back to Fort Hare for his graduation in 1943. On his return to the Great Place at Mkhekezweni the King was furious and said if he didn’t return to Fort Hare he would arrange wives for him and his cousin Justice. They ran away to Johannesburg instead arriving there in 1941. There he worked as a mine security officer and after meeting Walter Sisulu, an estate agent, who introduced him to Lazar Sidelsky. He then did his articles through the firm of attorneys Witkin Eidelman and Sidelsky. Meanwhile he began studying for an LLB at the University of the Witwatersrand. By his own admission he was a poor student and left the university in 1948 without graduating. He only started studying again through the University of London and also did not complete that degree. Nelson Mandela, while increasingly politically involved from 1942, only joined the African National Congress in 1944 when he helped formed the ANC Youth League. In 1944 he married Walter Sisulu’s cousin Evelyn Mase, a nurse. They had two sons Madiba Thembekile ‘Thembi’ and Makgatho and two daughters both called Makaziwe, the first of whom died in infancy. They effectively separated in 1955 and divorced in 1958. Nelson Mandela rose through the ranks of the ANCYL and through its work the ANC adopted in 1949 a more radical mass-based policy, the Programme of Action. In 1952 he was chosen at the National Volunteer-in-Chief of the Defiance Campaign with Maulvi Cachalia as his Deputy. This campaign of civil disobedience against six unjust laws was a joint programme between the ANC and the South African Indian Congress. He and 19 others were charged under the Suppression of Communism Act for their part in the campaign and sentenced to nine months hard labour suspended for two years. A two-year diploma in law on top of his BA allowed Nelson Mandela to practice law and in August 1952 he and Oliver Tambo established South Africa’s first black law firm, Mandela and Tambo. At the end of 1952 he was banned for the first time. As a restricted person he was only able to secretly watch as the Freedom Charter was adopted at Kliptown on 26 June 1955. Nelson Mandela was arrested in a countrywide police swoop of 156 activists on 5 December 1955, which led to the 1956 Treason Trial. Men and women of all races found themselves in the dock in the marathon trial that only ended when the last 28 accused, including Mr. Mandela were acquitted on 29 March 1961. On 21 March 1960 police killed 69 unarmed people in a protest at Sharpeville against the pass laws. 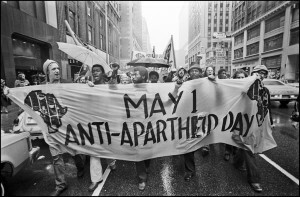 This led to the country’s first state of emergency on 31 March and the banning of the ANC and the Pan Africanist Congress on 8 April. Nelson Mandela and his colleagues in the Treason Trial were among the thousands detained during the state of emergency. During the trial on 14 June 1958 Nelson Mandela married a social worker Winnie Madikizela. They had two daughters Zenani and Zindziswa. The couple divorced in 1996. Days before the end of the Treason Trial Nelson Mandela travelled to Pietermaritzburg to speak at the All-in Africa Conference, which resolved he should write to Prime Minister Verwoerd requesting a non-racial national convention, and to warn that should he not agree there would be a national strike against South Africa becoming a republic. As soon as he and his colleagues were acquitted in the Treason Trial Nelson Mandela went underground and began planning a national strike for 29, 30 and 31 March. In the face of a massive mobilization of state security the strike was called off early. In June 1961 he was asked to lead the armed struggle and helped to establish Umkhonto weSizwe (Spear of the Nation). On 11 January 1962 using the adopted name David Motsamayi, Nelson Mandela left South Africa secretly. He travelled around Africa and visited England to gain support for the armed struggle. 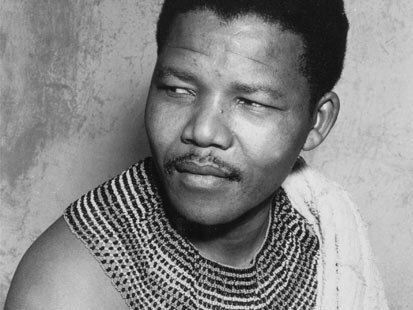 He received military training in Morocco and Ethiopia and returned to South Africa in July 1962. He was arrested in a police roadblock outside Howick on 5 August while returning from KwaZulu-Natal where he briefed ANC President Chief Albert Luthuli about his trip. He was charged with leaving the country illegally and inciting workers to strike. In fact for much of the latter half of the decade, he was one of the 156 accused in the mammoth Treason Trial, at great cost to his legal practice and his political work, though he recalls that, during his incarceration in the Fort, the communal cell “became a kind of convention for far-flung freedom fighters”. After the Sharpeville Massacre on March 21. 1960, the ANC was outlawed, and Mr Mandela, still on trial, was detained, along with hundreds of others. The Treason Trial collapsed in 1961 as South Africa was being steered towards the adoption of the republic constitution. With the ANC now illegal the leadership picked up the threads from its underground headquarters and Nelson Mandela emerged at this time as the leading figure in this new phase of struggle. 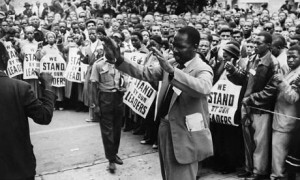 Under the ANC’s inspiration, 1 400 delegates came together at an All-in African Conference in Pietermaritzburg during March 1961. He was convicted and sentenced to five years imprisonment which he began serving in Pretoria Local Prison. 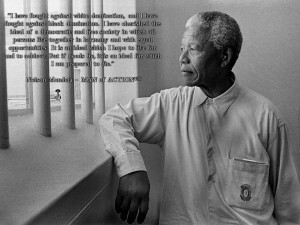 On 27 May 1963 he was transferred to Robben Island and returned to Pretoria on 12 June. Within a month police raided a secret hide-out in Rivonia used by ANC and Communist Party activists and several of his comrades were arrested. On 11 June 1964 Nelson Mandela and seven other accused Walter Sisulu, Ahmed Kathrada, Govan Mbeki, Raymond Mhlaba, Denis Goldberg, Elias Motsoaledi and Andrew Mlangeni were convicted and the next day were sentenced to life imprisonment. Denis Goldberg was sent to Pretoria Prison because he was white while the others went to Robben Island. George Cohen, New York, New York, United States Apparently May 1, 1977 The message is reaching the USA. On 31 March 1982 Nelson Mandela was transferred to Pollsmoor Prison in Cape Town with Sisulu, Mhlaba and Mlangeni. Kathrada joined them in October. 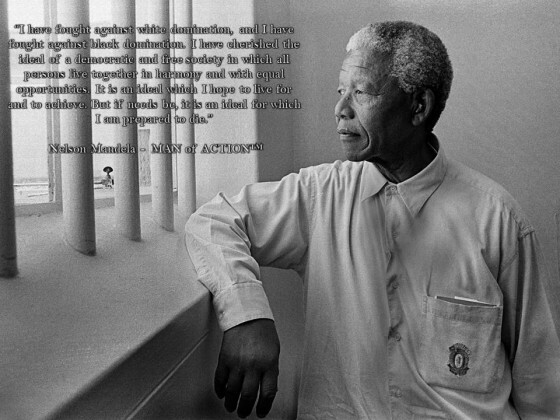 When he returned to the prison in November 1985 after prostate surgery Nelson Mandela was held alone. Justice Minister Kobie Coetsee had visited him in hospital. Later Nelson Mandela initiated talks about an ultimate meeting between the apartheid government and the ANC. In 1988 he was treated for Tuberculosis and was transferred on 7 December 1988 to a house at Victor Verster Prison near Paarl. He was released from its gates on Sunday 11 February 1990, nine days after the unbanning of the ANC and the PAC and nearly four months after the release of the remaining Rivonia comrades. Throughout his imprisonment he had rejected at least three conditional offers of release. Nelson Mandela immersed himself into official talks to end white minority rule and in 1991 was elected ANC President to replace his ailing friend Oliver Tambo. In 1993 he and President FW de Klerk jointly won the Nobel Peace Prize and on 27 April 1994 he voted for the first time in his life. On 10 May 1994 he was inaugurated South Africa’s first democratically elected President. On his 80th birthday in 1998 he married Graça Machel, his third wife. 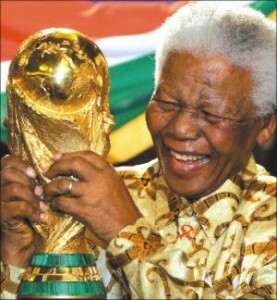 True to his promise Nelson Mandela stepped down in 1999 after one term as President. He continued to work with the Nelson Mandela Children’s Fund he set up in 1995 and established the Nelson Mandela Foundation and The Mandela-Rhodes Foundation. Following the success of Nelson Mandela’s 90th birthday celebrations in London’s Hyde Park in June 2008, it was decided that there could be nothing more fitting than to celebrate Mr Mandela’s birthday each year with a day dedicated to his life’s work and that of his charitable organisations, and to ensure his legacy continues forever. On 22 June 2013, CBS News stated that he had not opened his eyes in days and was unresponsive, and the family was discussing how much medical intervention should be given. Former bodyguard Shaun van Heerden, described by CBS News as “Mandela’s constant companion for the last 12 years“, had publicly asked the family to “set him free” a week prior. On 23 June 2013, Zuma announced that Mandela’s condition had become “critical”. Zuma, accompanied by the Deputy President of the ANC, Cyril Ramaphosa, met Mandela’s wife Graça Machel at the hospital in Pretoria and discussed his condition. On 25 June Cape Town Archbishop Thabo Makgoba visited Mandela at the hospital and prayed with Graça Machel Mandela “at this hard time of watching and waiting”. The next day, Zuma visited Mandela in the hospital and canceled a visit scheduled for the next day to Mozambique. A relative of Mandela told The Daily Telegraph newspaper he is on life support. On 4 July, it was reportedly claimed in court papers that Mandela was in a permanent vegetative state and life support should be shut off. However, the South African Presidency later stated that, according to the doctors treating him, Mandela was not in a vegetative state. On 10 July, Zuma’s office announced that Mandela remained in critical but stable condition, and was responding to treatment. South Africa’s president says Nelson Mandela’s health continues to improve as he marks his 95th birthday. Court documents filed by the family earlier this month had said Mandela was on life support and near death. He has been the hospital since June 8, and officials say his condition is critical but stable. 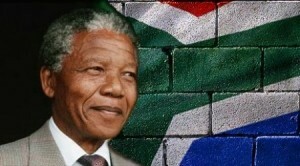 South Africa – July 18 is known as Mandela Day. It is the former South African President and anti-Apartheid hero’s birthday. The World reports: ‘He ‘would have’ ( he did ) turned 95 years old, this year. Nelson Mandela cannot celebrate his Birthday on July 18, though he will always be remembered for his contribution to a peaceful transition from apartheid to democracy. Many South Africans and international people believe that Nelson Mandela has passed on and that the government is conspiring to keep him ‘alive’ for dubious reasons only. The current news reports about people praying outside the hospital, and no official announcements are made. There is not much happening outside the hospital, it is quiet and July 18 marks Mandela being in hospital for 41 days. It is sad that this lie has now demonstrated the truth of a corrupt government. Mandela was a man of considerable influence who lived an extraordinary life, and has left a legacy for us to move forward and make our world a better place. Yet the greed and power emanating from the Mandela name is hurtful and gives a significant amount of negative publicity toward a government that has not been truthful, regarding this issue. A sad time indeed and we should all remember Nelson Mandela with respect and celebrate his life; we should remain grateful that we are alive and have the opportunity to make that difference. Mandela may not be with us in person, (as he lays in hospital) but his spirit remains forever with us, and we have the incredible memories of a man who made a transformation. This Mandela day will be different because it will be marred by the deception of the government. People will focus on the intimate and meaningful participation, yet not knowing the truth will add a tinge of doubt into any celebration. 40 days are a fairly significant number of days in history; the days in the wilderness; the rain for 40 days and nights – and, perhaps, the most significant will be the official announcement of Mandela’ death. A number that throughout history has portrayed an important meaning. Biblical. NOTICE: The media this week has globally created a massive state of confusion among the followers of Nelson Mandela, leading all to believe death was here. AS of July 20, we have all been confirmed by Zuma’s office, the only source that is empowered to issue official updates on the health of the revered leader, that he is alive and still recovering in hospital in Pretoria, South Africa. 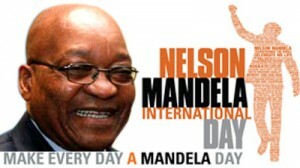 The Mandela Day campaign message is simple:‘ Mr Mandela gave 67 years of his life fighting for the rights of humanity. All we are asking is that everyone gives 67 minutes of their time, whether it’s supporting your chosen charity or serving your local community’. Mandela Day has been officially adopted by the United Nations as “Nelson Mandela International Day”. The resolution was unanimously adopted on November 10, 2009, with the support of all UN member states and co-sponsorship of over 165 members, from all regions of the world. This represents the overwhelming support of the entire international community in honouring Mr Mandela. We hope this signals the beginning of greater involvement by the global community in this movement for good. Read the speech made by Helene Hoedl, Deputy Director of the UN Information Centre, which she gave at the launch of Nelson Mandela International Day on March 28, 2011. Mandela Day is an annual international day of humanitarian action in celebration of Mr Mandela’s life and legacy. It serves as a catalyst for each and every person to realise that they have the ability to change the world through action. It is not about creating institutions with huge infrastructure, but it is a global movement for good which recognises that positive change begins with small actions. These actions can range from a vision for creating peace and reconciliation to sharing food with a neighbour in need. Mandela Day is particularly geared towards people doing work in their communities and is not event-driven. It is not a holiday. As Mr Mandela has reminded us, “It’s in our hands” to create a better world. We take inspiration from his example to take responsibility for ourselves and to understand our responsibility to others. We would like to express our gratitude to the South African government for its efforts in making this international resolution possible. 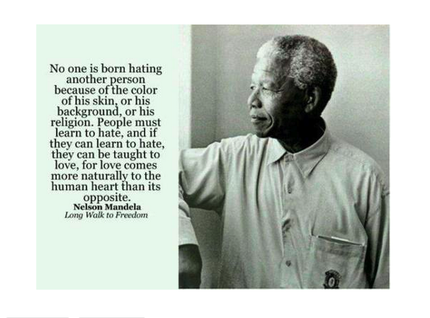 Nelson Mandela never wavered in his devotion to democracy, equality and learning. Despite terrible provocation, he never answered racism with racism. His life has been an inspiration to all who are oppressed and deprived, to all who are opposed to oppression and deprivation. The overarching objective of Mandela Day is to inspire individuals to Take Action to help change the world for the better, and in doing so build a global movement for good. Ultimately it seeks to empower communities everywhere. Individuals and organizations are free to participate in Mandela Day as they wish. We do however urge everyone to adhere to the ethical framework of “service to one’s fellow human”. What does Nelson Mandela mean to you and why? Share your thoughts through a phone-in service and also submit and view messages left by people from all over the world on an interactive map here. 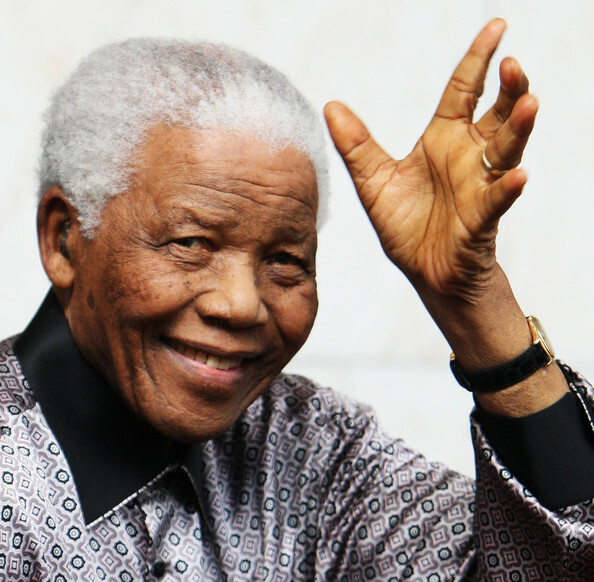 Click here to read the latest news updates about Mandela. – The SABC, Telkom and the Nelson Mandela Centre of Memory have launched a phone-in service inviting members of the public to leave messages of support for Madiba in their home languages. Crowds of well-wishers gather outside the Medi-Clinic Heart Hospital in Pretoria on Friday July 20, 2013 wish former South Africa’s first black president Nelson Mandela a quick recovery. ALL previous reports have turned to be false, and our world is blessed to still have this soul in a physical form. GOD BLESS. The Nelson Mandela Foundation – The Nelson Mandela Foundation, through the Centre of Memory and Dialogue programmes, contributes to the making of a just society by promoting the values, vision and work of our Founder. Take Action for Mandela Day !!! 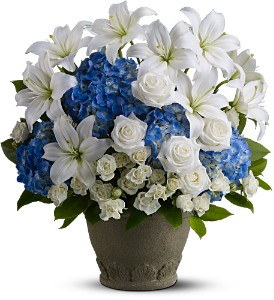 welcomes this tower of strenth into our global alumni of awakened males with open arms, wishing him all the blessings of health, joy and peace; as his has toiled on this mission for all of us for so long.